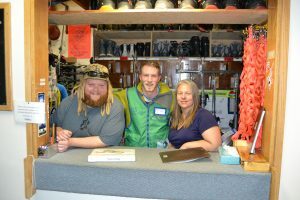 Equipment Shop Volunteers help during the ski and snowboard program season. They distribute participant equipment in the morning and afternoon while working on an outgoing, energetic team! The NSCD has a high-volume rental shop specializing in adaptive ski and snowboard equipment. 12 volunteer days and 1 training day to earn a free winter season Winter Park Resort Ski Pass. Please Note: The NSCD-issued Winter Park Resort day and season passes are issued to volunteers who do not own a pass of their own that includes Winter Park Resort. Additionally, NSCD passes are only for the volunteer and are not transferable to others. The average volunteer day is 8:00 a.m.-4:00 p.m. Volunteers pick the same day each week to help throughout the season. Training occurs November – December and volunteers work in the equipment shop January – March.